EOTW 2 Pack IPX8 Universal Waterproof Case for Smartphone Device to 6'' Fit iPhone X/8/8plus 7plus/6plus Samsung Galaxy s8/s8plus/s7 Google Pixel HTC10,for Water Parks/Beach/Cruise/Pools snorkeling by EOTW at Got Busted Mobile. MPN: US_Drybag_BlkPin. Hurry! Limited time offer. Offer valid only while supplies last. ★Prepare Yourself for the Next Adventure EOTW Universal Waterproof Case pouch designed exclusively for most smartphone up to 6 inch diagonal size. 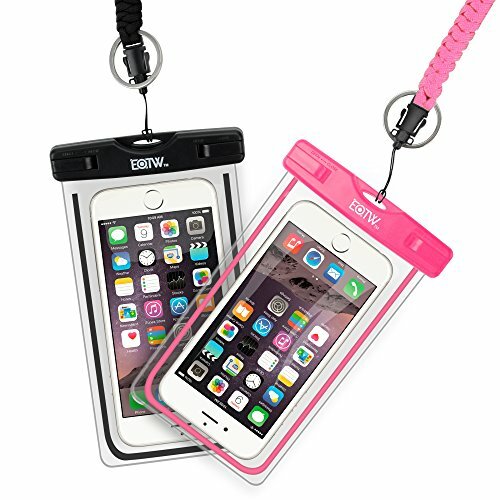 EOTW Universal Waterproof Case pouch designed exclusively for most smartphone up to 6 inch diagonal size. Nokia8 Sirocco, Nokia Lumia 920 900 640 520 521 , Honor 5X, Huawei Nexus 6P, Asus Zenfone 2 laser, Sony Z1 Z2, Sony Xperia M4 Aqua, etc. Innovative swivel lock design provides a user friendly experience when opening or sealing the pouch. Ultra Clear-film material allows full touch screen access and button control functionality as well as the ability to take photos while the pouch is still equipped. Comprehensive protection allows use in mud, water, snow, dirt, and grease. 1. Friendly Reminder: EOTW Universal Waterproof Case for most smartphone up to 6 in,Before using it, please put the case with paper towel and submerged them in kitchen sink to test if it will be water leaking. NOTE: Not support iPhone 7(Plus) Home button touch function.Make sure to set your camera button to a physical button when take underwater pics. 2.IPX8 Certificated: Fully submersible and waterproof, the waterproof case is designed for extreme wet conditions,dusty conditions, sandy conditions. 3. Highly Protects Your Belongings: The resilient EOTW Universal Waterproof Case Bag allows you to enjoy your active lifestyle without worrying about harming your device as the case bag protects your phone or device from elements such as dirt, dust, sand, and-yes-even water! Each case bag is tested under water for 30 minutes under 30m deep water to ensure resilience. 4. Adjustable Military Parachute Cord Rope Lanyard: Made of Military Parachute cords, with a minimum breaking strength of 300 pounds. This versatile cord was even used by astronauts during the 82nd Space Shuttle mission to repair the Hubble Space Telescope. The length of the lanyard is adjustable by moving the Double Barrel Cord Lock to adjust the length that you wear comfortable. 5. Feel at Ease: The airtight EOTW Universal Waterproof Case Bag does not interfere with your active outdoor lifestyle. cruise, water parks, beach, wave pool, ocean, pools, and parasailing, Took this on a snorkeling trip on vacation. or participate in your other favorite outdoor activity without leaving your device behind or worrying about protecting your device. If you have any questions about this product by EOTW, contact us by completing and submitting the form below. If you are looking for a specif part number, please include it with your message.